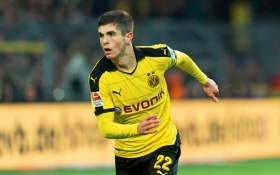 Chelsea are reportedly aiming to lower the asking price of Borussia Dortmund attacker Christian Pulisic ahead of a potential approach at the turn of the year. The United States international has just 18 months remaining on his existing deal with the Bundesliga outfit and this has increased speculation regarding his future. According to Goal.com, the Blues are looking into a winter agreement for the versatile attacker amid the uncertain situation surrounding the future of Eden Hazard. However, the west London giants are unwilling to pay Dortmund's current valuation of £70m and they are prepared to hold discussions to lower the player's asking price. Chelsea have experienced a good Premier League season under new boss Maurizio Sarri but they have recently dropped off from the league leaders amid successive winless matches. The Blues are currently occupying the fourth position with 28 points, just one point ahead of Arsenal with whom they could be jostling for the final Champions League spot.